WEST HOLLYWOOD, Calif., Nov. 8, 2018 /PRNewswire/ -- Mod Sélection Champagne today announced its release in the United States. Produced in an exclusive enclave of the Vallée de la Marne for over five generations, Mod Sélection has a legacy and authenticity dating back to 1892. Selected as the finest house in Champagne by award-winning wine and spirits producer Brent Hocking for its exceptional dedication to purity, balance and finesse. Only now has this superior Cuvée become available for release. Mod Sélection is the purest expression of balance and terroir in Champagne. Prized for its delicate extraction and superior juice selection, Mod Sélection distinguishes itself from the overtly autolytic characteristics of many Champagnes today. Its Pinot Meunier dominant Cuvées are produced using meticulous settling, natural clarification and rigorous fermentation controls. Its Mod Rosé is one of few Champagnes produced via the rare Saignée method. All processes are carried out with exacting precision to preserve the fresh, bright and balanced house style. After years of careful planning and design, Mod Sélection becomes the first of its kind to master an avant-garde Champagne bottle décor and adornment process never before seen in the region. Mod Sélection, a conception of the brand's founder, represents a modern interpretation of the tradition, heritage and elegance that is Champagne. 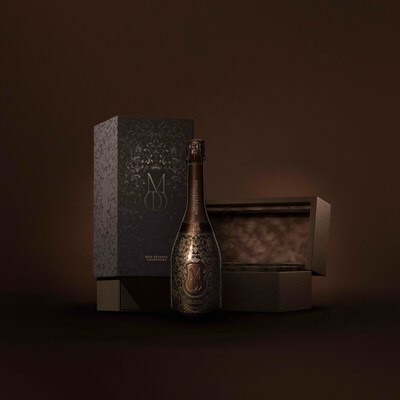 Pushing packaging and design to its limits, the rich brown metallic, delicate symbolized patterns and embellishments are handcrafted and applied by the finest artisans in Champagne, ensuring no two bottles are ever alike. Mod Sélection comes to market with an entire ten-variant Champagne portfolio aged up to ten years on the lees including Non-Vintage, Vintage, Rosé de Saignée, Vintage Rosé de Saignée, Grand Cru Blanc de Blancs, Vintage Blanc de Blancs, Blanc de Noirs and Single Vineyard, Estate-Grown Tete de Cuveé all ready for release. The Mod Réserve and Mod Rosé variants in 750ml, 1.5L Magnum and 3L Jeroboam presentations will be the first of the line to debut. Releases from the highly sought after 2008 Vintage to follow. Although Mod Sélection has well-known and prominent partners, all are focused on bringing the quality of this exquisite Champagne to the forefront. Once commissioned by political and industry elite, the house of Mod Sélection Champagne is proud to showcase these elegant Champagnes on the world stage. "The meticulous process and purity of this Champagne throughout all variants is simply stunning," says Hocking, Founder & CEO of Mod Sélection Champagne. "Yes, we have some very interesting and publicized people who love this Champagne, but the authenticity and quality of the wine are what they are fans of." Southern Glazer's Wine & Spirits has been appointed the exclusive distributor of Mod Sélection Champagne in the United States and Canada. Mod Sélection is the latest release in Hocking's expanding portfolio of luxury wines and spirits. The portfolio, beginning with the introduction of the ultra high-end original DeLéon Tequila in 2009 which sold to Diageo in 2013, additionally includes Virginia Black Decadent American Whiskey. Virginia Black, a collaboration with global superstar Drake, will also now be distributed by Southern Glazer's Wine and Spirits in the United States and Canada, allowing for more fans than ever to enjoy the decadent whiskey Wine Enthusiast rated 91 Points. For more information on Mod Sélection Champagne, visit www.modselectionchampagne.com.